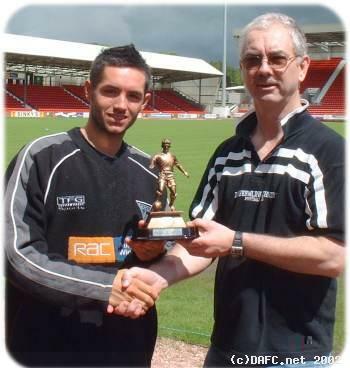 The fans on DAFC.net chose Scott Thomson as Player of the Year and Gary Mason as Young Player of the Year. I presented both players with a Trophy today and the best wishes of the fans. We have to remind ourselves that its not just one or two players who excelled throughout the year. Dunfermline Athletic work as a team and all the players deserve credit this year for the spirit in which they performed all season. well done !